Four members participated in the bag swap. 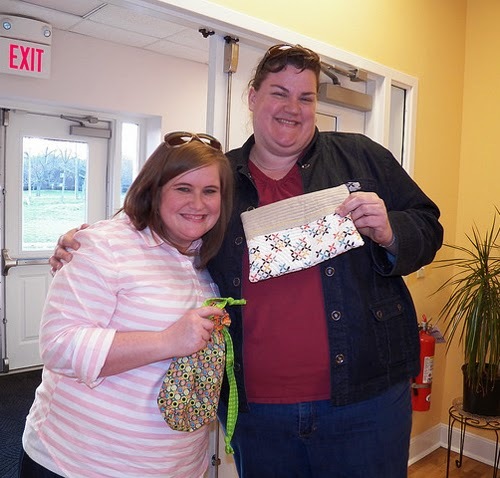 Christine received Andie's zippered pouch. 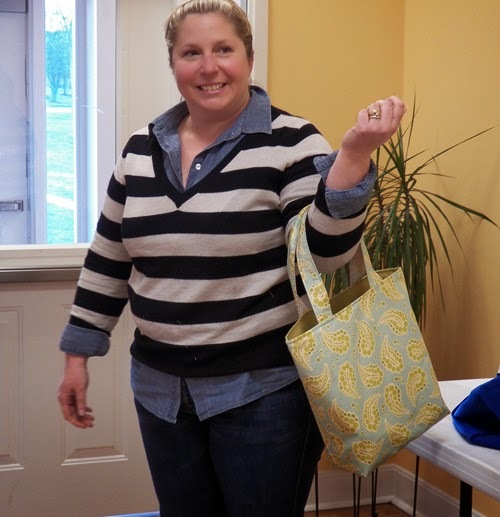 Kim received Brooke's drawstring bag, and Brooke received Kim's bag with the decorative stitching. Michael Miller Fabric Challenge: Our fabric for the challenge arrived! And the deadline for the Challenge has been extended to July 25. 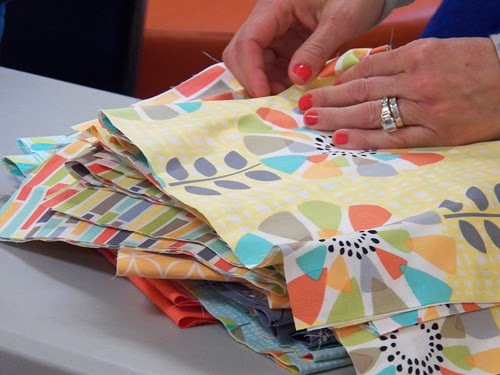 Click here for more info on the Michael Miller Fabric Challenge (to access link you must be logged into the MQG website). Just a reminder, CMQG is challenging its members to make quilts with their fabric and to then donate those quilts to Project Linus. Check out last month's meeting post for more info. Quilt Con: Will be held February 19-22, 2015 in Austin, TX. Registration for members is June 24 and will begin at 10am EST. 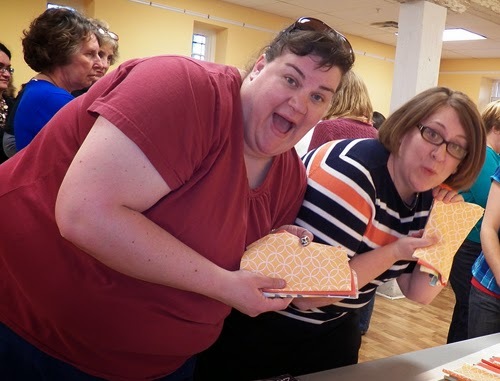 Click here for more on Quilt Con. The conference will also include a quilt show that's open to members. Entries in the show will be accepted starting July 1. Click here for the link to the forms on the ModernQuilt Guild site and for more info. Modern Quilt Guild Showcase at International Quilt Festival and Market: There's a call for entries to participate in a Modern Quilt Guild Showcase. Submissions will be accepted from May 30 to June 27. The quilts for the show will be chosen and the makers will be notified on August 1. Click here for more information and for the entry form. Help with Entry Fees: To encourage our members to participate in the above shows, CMQG will reimburse you for $15 of your entry fee! One $15 fee-reimbursement per member for 2014. 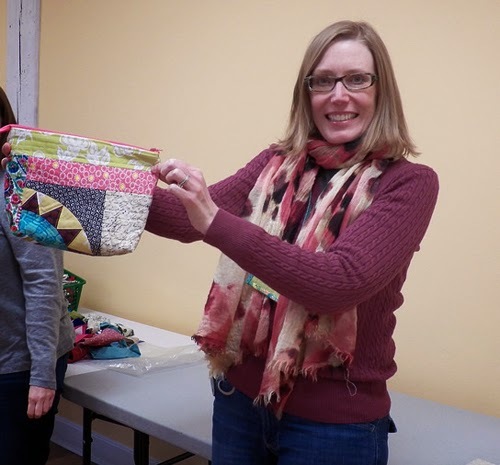 May Meeting: Bring back your Traveling Quilt/ Round Robin blocks and show them off! Members were asked to bring their favorite tool to the April meeting and tell the group a bit about it.